George B. 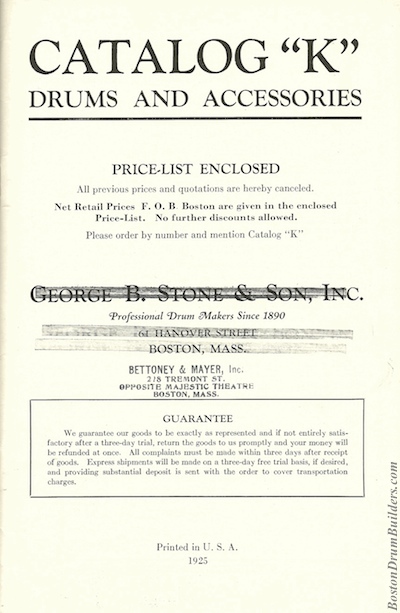 Stone & Son's Catalog K featured the widest and most comprehensive array of products ever offered by the company. 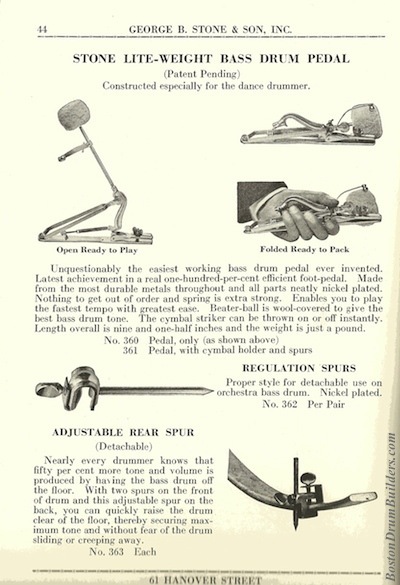 The catalog was prepared in 1924 during the tenure of Sales Manager J. W. Neptune for the 1925 calendar year. 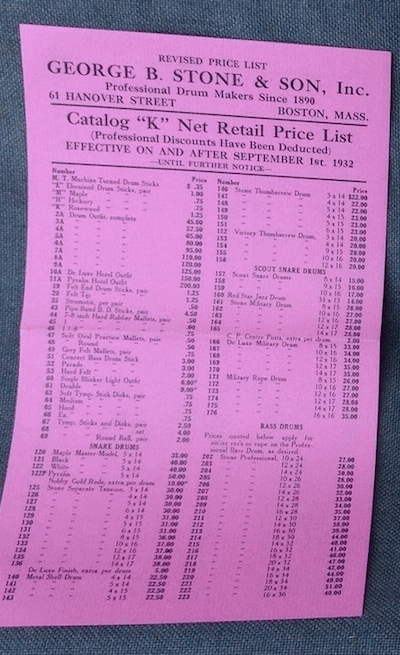 The inside cover of Catalog K reads "Printed in U.S.A. / 1925" but price lists referencing Catalog K are dated as early as October, 1924 suggesting that it was in fact published sometime late that year. Then under the command of second generation owner George Lawrence Stone, the family business was nearing the end of it's prime as their wood hoop snare drums were quickly becoming old fashioned. At the same time, Stone's hands-on construction methods were proving to be inefficient and uneconomical on a scale large enough to compete with the industry titans of the Midwest. By the mid 1920's, the younger Stone was gradually shifting away from manufacturing and more towards writing, teaching, and overseeing the Stone Drum School which operated concurrently alongside George B. Stone & Son Inc. Ultimately, George Lawrence was unwilling to modernize the operation and allowed Stone & Son to fade from prominence over the next decade and into obscurity by the late 1930s. Nevertheless, Catalog K provides a fascinating look into Boston's largest and most complete drum company as it neared the end of its golden age. The catalog spans 63 pages and displays the largest and most complete array of instruments ever offered by Stone. 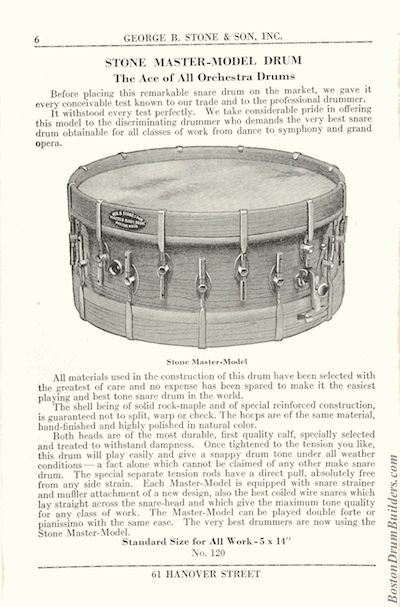 The Master-Model Drum is prominently featured as the company's premier snare drum offering. Two full pages are devoted to the Master-Model which is pictured in both natural and black finishes and is listed in only the 5" x 14" size. The Separate Tension Snare Drum, formerly the flagship snare drum offering, is still included but now takes a back seat to the Master-Model. 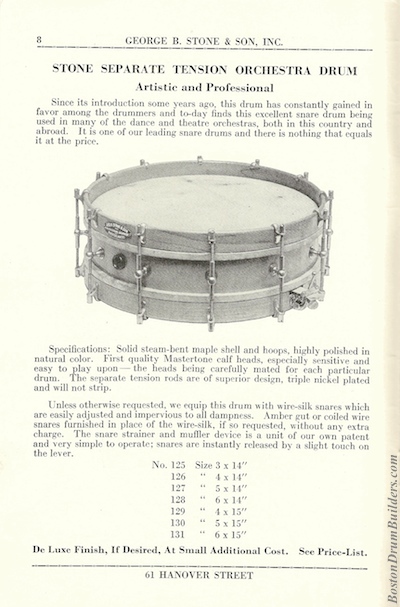 Eleven snare drum models in total are included in Catalog K and all but the "Metal Shell Drum" appear to be built in house at the time the catalog was written. Complete drumsets were offered for the first time and came in eight configurations. 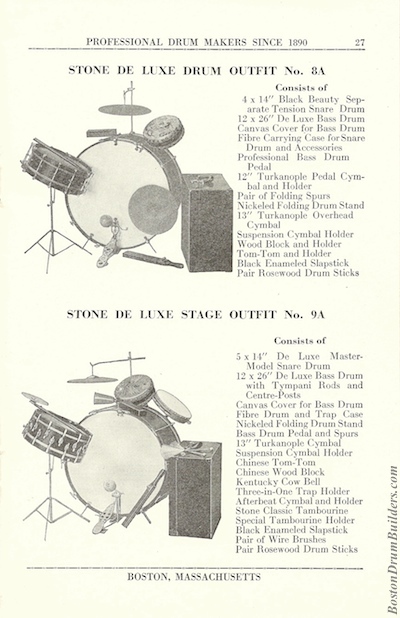 The most elaborate kit catalogued was the "Stone De Luxe Stage Outfit" which consisted of a 5" x 14" Master-Model Snare Drum and 12" x 26" single tension bass drum with covers for each, a snare drum stand, bass drum pedal and spurs, a 13" cymbal with suspension holder, a chinese tom-tom, a woodblock and cowbell with trap holder, a snare drum mounted cymbal holder, as well as a tambourine, a slapstick, a pair of brushes and a pair of sticks. 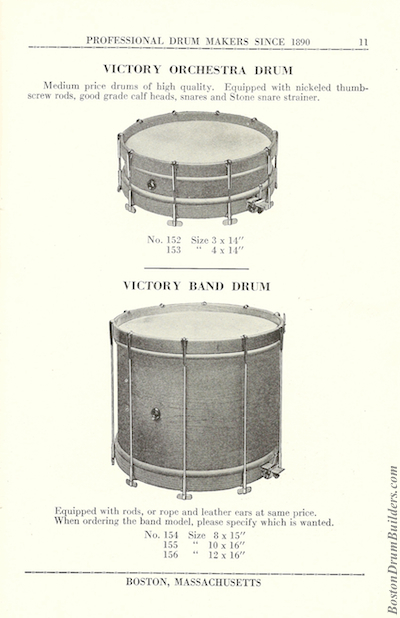 The Victory model line of drums, Stone's more economical series of instruments, are listed in five sizes under the headings of the "Victory Orchestra Drum" and the "Victory Band Drum". Victory model bass drums are also offered in five sizes. 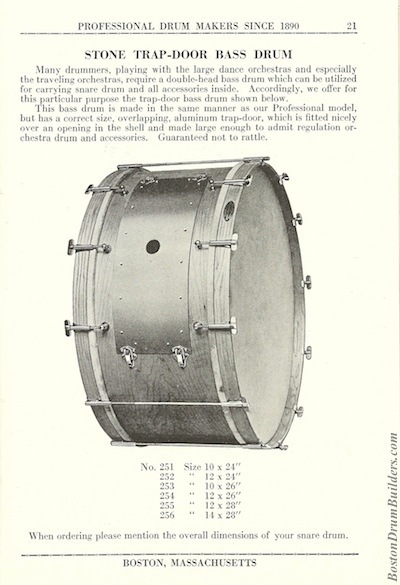 The "Stone Trap-Door Bass Drum" appears for the first time along with the Separate Tension Bass Drum, several single tension snare drum models, and the Stone Military Bass Drum which was a double strung rope drum with leather ears. 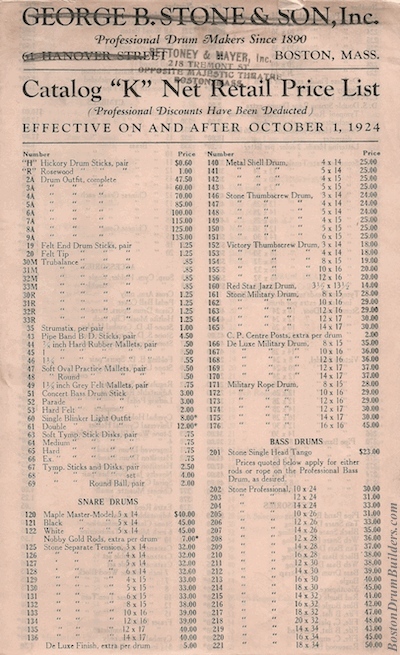 The catalog also lists a wide variety mallet percussion instruments - some of which were made in house but many of which were produced by Deagan and merely distributed by Stone. The 'Stone Lite-Weight Bass Drum Pedal', which is of metal construction, is the first bass drum pedal pictured and is touted as "the easiest working bass drum pedal ever invented". Metal bass drum pedals by Ludwig and Fraser are listed on the following page. 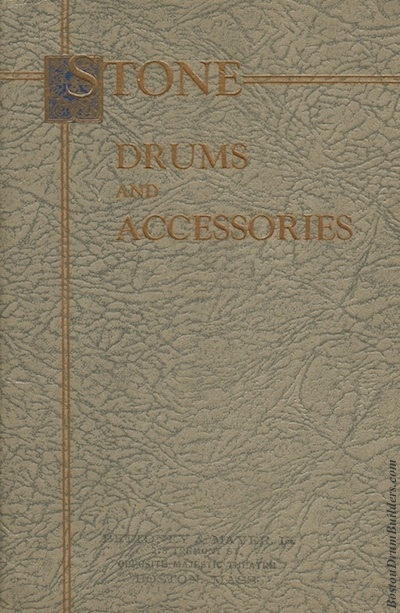 A full line of small instruments, traps, parts and accessories was available as was an expanded selection of music including method books and xylophone solos. The two price lists pictured below are from 1924 and 1932 respectively, and are very similar in terms of the products they offer although there are a few differences, the most notable being the inclusion of a "Pyralin" wrapped Master-Model in the 1932 version. Interestingly, the prices listed in 1932 are actually lower than those published almost exactly eight years earlier. Perhaps this was a response to the economic conditions of the time as the Great Depression was setting in. The bleak financial times could also help to explain why Stone was continuing to use outdated advertising materials. Regardless, the very fact that Stone kept the same catalog in circulation for so many years is clear evidence that George Lawrence was allowing the company to fade. There is in existence a "Booklet L" from Stone & Son though I do not own a copy or know the date of publication. But if Catalog K was still being used in 1932, Booklet L may well have been released after that time and could have been the last large scale advertising publication put out by Stone. It is also possible that Booklet L was only an updated supplement to the larger Catalog K. It would be fascinating to compare the two volumes if and when a copy of "L" can be located. Do you have an instrument by Geo. B. Stone & Son? I want to hear from you! Send Lee an email at lee@vinson.net.